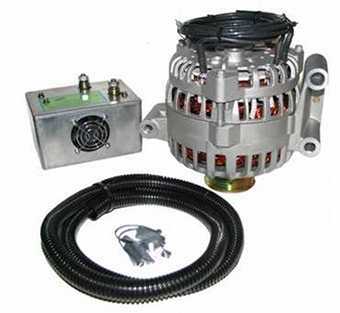 The larger diameter stator and overall increased mass allows the alternator to generator more power at slower speeds. Where a small case alternator only starts puting out extra power at near highway speeds, our large case units put out as much as 60% rated output at 650 RPM idle. The larger mass of the unit gives it increased heat dissipation and absorption. Basically, it takes more energy to heat up the larger unit. Combine this with an extra heavy duty Bridge Rectifier with Copper Diodes and Aluminum Heatsink and you have an extremely durable alternator. Fits 1999 and up Ford Diesel motors. A must for Snow Plows, Police and Emergency, Off road Vehicle and any other high electrical demand situations. For Extreme use situations see our other high output, 6G compatible alternators with Quicktifier external rectifier added for maximum reliability.